Located at the intersection of Le Mans and the autobahn, you’ll find the 2016 Corvette Z06. A true world-class supercar, Z06 was conceived on the track and is engineered with a lightweight and rigid aluminum space frame as well as a supercharged 6.2L aluminum V8 engine delivering 650 horsepower and 650 lb.-ft. of torque. 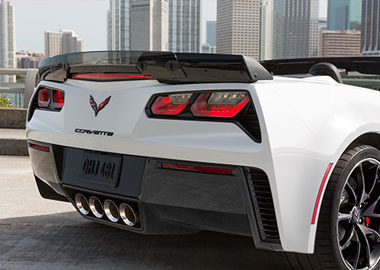 Z06 is powered by an LT4 supercharged 6.2L aluminum V8 engine delivering 650 horsepower and 650 lb.-ft. of torque. With a choice of transmissions as well as Direct Injection, Active Fuel Management™ and Continuously Variable Valve Timing, Z06 is a powerful, efficient sports car. Don’t just own a Z06 – Build It. The Corvette Z06 Engine Build Experience offers a unique opportunity to be involved in the creation of your Z06, allowing you to assemble the 650-hp supercharged LT4 engine at the heart of your new Corvette. Z06 is the first 650-horsepower supercar available in both coupe and convertible as well as automatic or manual transmission. Since Z06 was developed from the start to be an open-top vehicle, coupe and convertible share the same aluminum frame structure, and are designed to reduce drag and keep the vehicle firmly planted to the road. 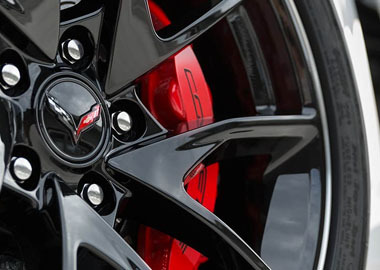 Z06 accessory blade wheels in Black with standard Red brake calipers. 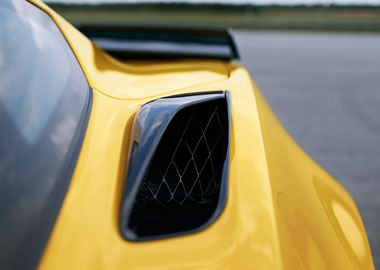 Z06 features unique air blades over the inlets on the rear fenders for maximum cooling. Z06 features a number of unique color schemes to emphasize the driver-centric cockpit, as well as a unique flat-bottom steering wheel. The standard Grand Touring seat and available Competition Sport seat each feature a lightweight magnesium frame and cradle the driver for optimal comfort and support. With available 4G LTE Wi-Fi® connectivity, the latest Chevrolet MyLink 8-inch diagonal screen, easy-to-use driver modes and an industry-exclusive Performance Data Recorder, Z06 is a technologically advanced supercar. Apple CarPlay™ takes the iPhone features that are useful to use while driving and puts them on the vehicle’s display in a clean, simple way. This allows you to make calls, send and receive messages and listen to music right from your touch-screen or by voice using Siri. Apple CarPlay™ supported apps include Phone, Messages, Maps, Music and compatible third-party apps. Z06 keeps you connected and entertained with a retractable 8-inch diagonal high-definition MyLink color touch-screen. Using steering wheel controls, hand gesture recognition and voice recognition capabilities, you can talk, text and stream music without taking your hands off the wheel. Z06 employs a host of safety technologies to help keep you safe before, during and after a possible collision. Z06 helps to prevent potential danger with features like Active Handling and 4-wheel antilock brakes to keep you in control, while standard Xenon high-intensity discharge headlamps help visibility by emanating 900 lumens of light. And if Z06 ever loses tire pressure, run-flat tires enable safe functioning at a moderate speed until the tire can be repaired. In the event of a collision, Z06 is designed to help keep you and your passengers safe with seat-mounted head and thorax air bags and a rigid aluminum frame structure that is stiffer than that found in the previous-generation Corvette models.